Located in the heart of the beautiful Dingle Peninsula, Glen Cottage is the ideal base from which to enjoy all that the area has to offer. The Dingle Peninsula is world renowned for it's beautiful scenery. fine sandy beaches and rich archeological heritage. In Dingle town you will find many excellent restaurants, craft shops, galleries and a wide selection of pubs with live traditional music. The town is built around a thriving fishing port and in recent years has become famous for the resident bottlenose dolphin "Fungi". 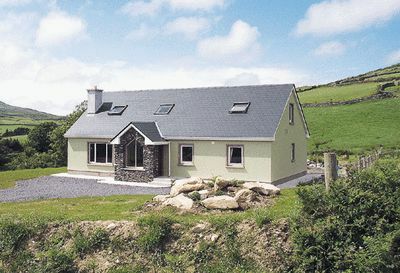 Situated just five kilometers from Dingle, Glen Cottage is set in tranquil countryside. Newly built in 2005 this five bedroom cottage has been finished to the highest standards.and can sleep up to ten people comfortably. Large Oak fitted kitchen/dining area with integrated appliences and seating for ten. Livingroom with open fire (gas), satelite TV, DVD, books, magazines and family games. Second seating area upstairs. Five bedrooms, (2 double, 3 twin) four of which have ensuite bathrooms. Main Bathroom with bath and large seperate shower. Smoking is not permitted in house. Hillwalking (cottage is on one of West Kerry's many hillwalking trails).